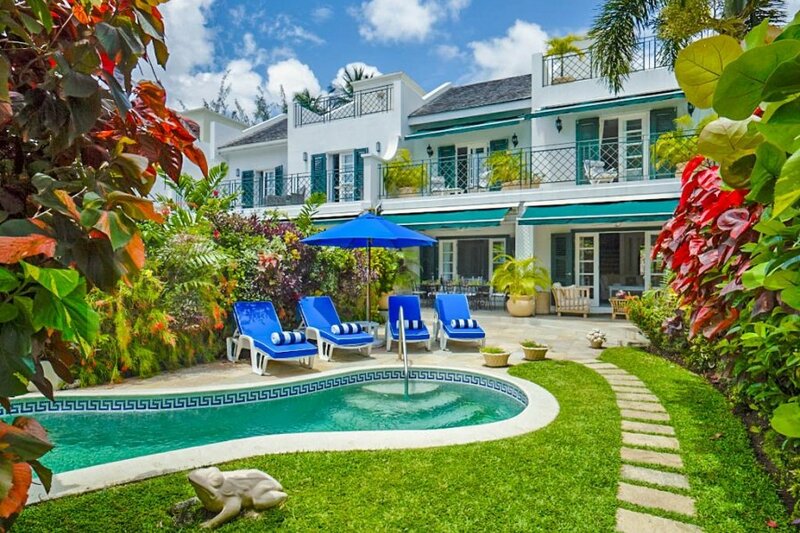 Villa Aanya is an excellent holiday home right on the Bajan coastline, with views of the Caribbean Sea and horizon, the three storey townhouse benefits from being in a prime sun catching location. It also houses a great amount of outside space as well as a bright and spacious interior. Guests will be delighted by the stunning sea views best enjoyed from the balcony's sun lounges and the furnished ground floor patio. Inside, the house is decorated in light and calming colours with elegant house flowers and contemporary and colourful wall art. The villa boasts a wonderfully modern, generously-equipped kitchen and opulent marble walled bathrooms. The house is beautifully surrounded by plants and trees and benefits from outdoor dining overlooking the pool and large comfy beds placed in all of the bedrooms. The living room contains wide doors opening out onto the garden, you will be able to lounge with them wide open, letting in the scent of the fresh sea air. Guests can also relax on the patio with a fine dining area that's perfect for evening meals under the stars. You can relish in the outdoors the first thing in the morning as the ground floor bedroom opens out onto a private terrace, and the two bedrooms on the first floor open out onto a shared terrace. Villa Aanya resides in the esteemed Mullins Bay Development where guests can the make the most of exclusive spa and gym facilities. You will be close by to both Holetown and Speightstown, each offering an array of fine eateries, shopping and sites. Villa Aanya is 3-bedroom villa, which sleeps 7-guests. This sleek and tidy villa, is ideal for a smaller group of friends or family who want to enjoy the Bajan culture whilst enjoying the luxury of the gated Mullins Bay community. In Speightstown, only an 8-minute drive away, you'll find Tiyi By Design Art Jewelry Studio which is a great place to admire local talent. The studio is full of handcrafted and artistic jewellery, with each being individually designed and created by a professional art jeweller. The artist Ichia Tiyi works in the studio, with her methods and practises being able to be viewed in real time, up close. You can even learn how to make your own small piece of original jewellery. If you want something stylish that details the talent of a local Bajan, this is the place to come to! The famed Cherry Tree Hill lies at only a 20-minute drive away from Villa Aanya. The picturesque location is regularly frequented to take photographs and take in the scenery. Although mostly empty, the hill is worth visiting when driving across the island, simply for its spectacular view over the east coast, hillside and the ocean. The road on the way is an adventure in itself and when you reach the hill, you'll be able to relax and take in the surroundings that were well worth stopping for. Known for its calming effect, Cherry Tree Hill borders the Parishes of Saint Peter and Saint Andrew and sits nearly 850 feet above sea level. It is part of the St. Nicholas Abbey plantation, which is a fantastic site itself.